Following President Michael Roth's Nov. 18 all-campus email and #IsThisWhy's response, Dean of Equity and Inclusion Antonio Farias issued a statement addressing campus inclusion as well as plans for change. Vice President of Equity and Inclusion and Title IX Officer Antonio Farias has issued a response on a web page under the Office of Equity and Inclusion’s, titled “Equity: Next Steps,” campus equity and inclusion, following the official publication of the Is This Why movement’s demands. The initial demands required a statement from Farias and University President Michael Roth addressing each demand within 48 hours of their being issued. Roth responded in a campus-wide email last week, approximately two days after the initial demands were made. Farias’ post, published Tuesday, Nov. 23, begins by addressing his desire to increase efforts to create a more inclusive campus environment for marginalized groups. 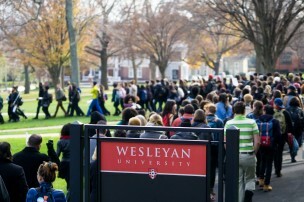 “In these troubling times, when campuses across the nation are grappling with institutional racism, I continually ask myself what more we can do to ensure that the lives of all of our students, and in particular our students of color, are free from discrimination that harms their experience at Wesleyan,” Farias wrote. In his message, Farias addressed a few specific measures that he and the Office of Equity and Inclusion aim to undertake in the next year. First, he announced that the Title IX Core Team would soon implement an expansion of the oversight on discriminatory behavior. The practices he intends to implement were recently shared with student organizers, faculty members, as well as the Board of Trustees. “We will be scheduling recurring community town halls, forums, and focus groups in order to take a robust accounting of current needs as well as to tap the vast community expertise we possess in the service of creating sustainable and significant changes designed to enhance our individual and collective ability to thrive,” Farias wrote. He also announced the immediate implementation of Maxient, an online reporting service that allows for the documentation and investigations of occurrences of bias and discrimination. For the spring 2016 semester, Farias and student leaders are currently discussing the establishment of a report similar to the Annual Report on Sexual Violence that provides information on the campus community, which will be made public via the Office of Equity and Inlclusion’s website. Farias’ final two points referred to specific dates by which the administration will achieve certain goals. The first involves a report on the campus community, similar to the annual Title IX report, to be issues beginning in spring 2016. Currently his office is in talks on how to best accomplish this goal. The second timeline refers to the filling the position of Dean of Equity and Inclusion, vacated earlier this month when Renee Johnston-Thornton was appointed Dean of the Class of 2018. Farias indicated that the position would be filled by February. Farias concluded his message by reaffirming his commitment to equity and inclusion on campus. A previously updated version of the original article continues below. 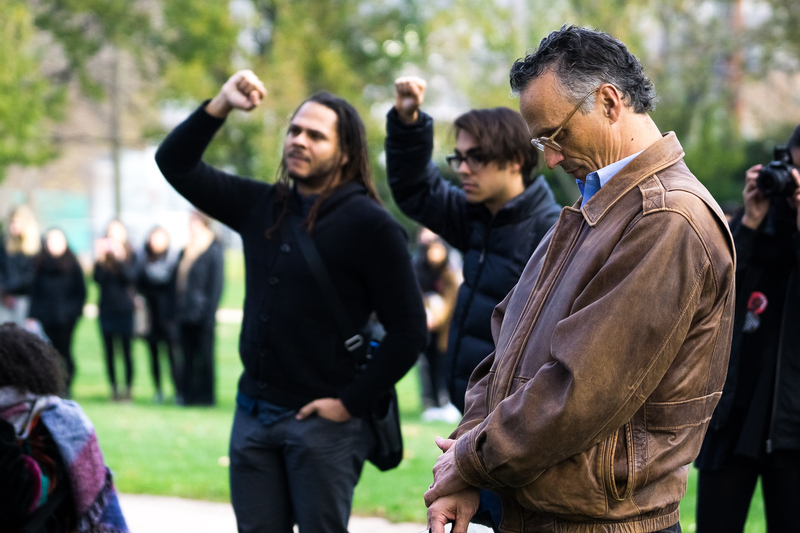 In response to the list of demands that students of color and allies presented on Wednesday, Nov. 18 during a march outside of South College, University President Michael Roth sent a campus-wide email addressing each of the points around 10:30 a.m Friday morning. By Saturday morning, organizers of the #IsThisWhy campaign released a brief statement online in reply to Roth, stating that his email insufficiently answered their concerns and promising further demands of the administration. “President Roth’s response proved him incapable of addressing exactly how the university has neglected each marginalized community on campus both in the past and in the present, and in doing so, he failed to produce a detailed action plan committing to the demands set forth by the #IsThisWhy organizers,” the statement reads. The statement asserted that, although Roth did respond within the 48-hour deadline listed in the original outline of demands, Vice President for Equity and Inclusion Antonio Farias failed to provide his own statement of accountability. No specific plans for the campaign’s next steps have been released yet. The Argus has reached out to campaign organizers, Farias, and Roth for requests to comment, and will update this article with any additional information. The Argus’s original article continues below. As stated on IsThisWhy.com, created by organizers, those demands included the stipulation that Roth must provide a response and make certain commitments within 48 hours, at which time, if the demands were not met, further action would be taken. The campus-wide email arrived approximately 90 minutes before the deadline. According to the email, Roth and his cabinet have spent the past two days reviewing each demand. To begin, he recognized the shortcomings of the University in their efforts toward equity on campus. Then, Roth launched into his response of the demands, addressing them one-by-one. “First, the demand for equity and inclusion, we embrace wholeheartedly,” Roth wrote. He continued to add that most issues brought up in the demands connect back to the need for equity and inclusion at the University. Second, Roth gave a statement of accountability for the ways in which he and his administration have failed to meet students’ needs in terms of racial sensitivity on campus. Further, Roth recognized the importance of freedom of expression and the need to recognize each student’s access to this right. He elaborated on this idea by informing the community that Associate Professor of History and Director of the Institute for African American Studies at University of Connecticut Jelani Cobb, who has expressed a different view of free speech in articles written for The New Yorker, will visit campus on Dec. 2 to meet with students and faculty. The ultimate goal for this meeting is to have students and faculty engage in a conversation regarding these issues and learn from one another’s ideals. “There are many ways in which I (and frankly, everyone at the University) can benefit from criticism,” Roth wrote. “It’s how we/I learn, and that’s what a university is about. By learning from one another, from keeping our conversations robust and meaningful, we will become a more equitable and inclusive place”. In response to the third demand—the hiring of an equity advocate to address the needs of marginalized populations on campus—Roth affirmed that the University has already taken steps in this direction, but will take into account student input to determine how to best address these needs. Additionally, Roth described the imminent hiring of a Counseling and Psychological Services (CAPS) staff member with inter-cultural expertise, in order to both expand CAPS services and address the needs of a wider range of students. “We authorized this position because dialogues with students identified a strong need, and we will continue our discussions about additional resources that will help all thrive at our university,” the email reads. Roth responded to number four, which calls for the establishment of a multicultural center, by stating that the administration is interested in moving forward with discussions regarding the space it would occupy and how it would be staffed. In regards to the fifth demand, Roth pointed out that the University already has systems in place for students to report professors’ microaggressions. He added that the University is working to identify trends of these incidents in students’ semesterly evaluations of professors. Finally, Roth acknowledged first-generation and low income students on campus, pointing out that, while not directly mentioned in the demands, these students are a vital part of the community, and often their struggles go unaddressed. He highlighted the administration’s plans to focus on the needs of these students. “We are working on plans right now to ease the economic burdens on those of our students most vulnerable to financial exigencies,” Roth wrote. Roth concluded the email by stating that he sees himself and the marchers as having the same goals. He expressed his hope that the community will be able to work together to achieve these common goals, and vowed to continue to work toward a more equitable campus. This article will be updated with additional information as the story develops. Unfortunately these angry and almost incoherent demands will probably set back multicultural campus relations and lead to a very different admissions selection process for minorities in the future, I say this as someone who has successfully protested against many campus policies and got real results through open dialog, civil disobedience and educating students and alumni about the issues. This one sided approach will only encourage administrations to look to admit more docile and assimilated students in the future, as they have done in the past when militant students caused too much campus division. College Presidents will take this type of extreme action to preserve their own jobs, because they know that eventually the will be the next to go. Make no mistake, the issues these students are protesting are real, but the divisive us vs. them way they are addressing these issues seems to exacerbate these problems more than educate other students and administrators to win them over to the cause. It’s really getting out of control. Now people are not even talking about these issues because they think they will be next. What point is there engaging with people who who can’t distinguish between friend and foe? Exactly right, I do not understand this scorched earth policy that drives away all possible allies. It reminds me of when Black Lives Matters chose to protest against Bernie Sanders first and not someone like Trump or Cruz. It’s as if they didn’t know Sanders was already an ally and has one of the strongest records on civil rights of anyone in elected office. Bernie also did sit-ins for Civil Rights when he was a student in the 60s, he gets it, but they obviously don’t These students do not realize that they have no power if they have no allies. And the campus can function just fine with the more docile student body that will soon be recruited as a result of their unfortunate actions, which includes voting to reduce fundiing of this newspaper. Engage with your opponents and embrace dialog, censorship and alienating you allies is not the solution. What do you expect? This is all they learned in high school during the times that they weren’t screeching and flinging their own feces at the teacher. The real purpose of identity politics (a/k/a Critical Race Theory) is to Balkanize groups of people into ever smaller “identity groups” each with their own special set of grievances that can never be resolved by society at large. The result is identity politics holding POC back from their full post-graduate potential. Below is a link to a fantastic opinion piece by Keli Goff recently posted to the Daily Beast. Ms. Goff is black and a writer for both television and news outlets. Her article is entitled, “How Diversity Police Halt Progress,” and it describes how toxic “identity politics” on college campuses are damaging the career opportunities of POC. That power is largely based on the timorous forbearance of the administration and the trustees. Your power will dissipate further when you graduate, as eventually you will have to associate with institutions that have better things to do than listen to endless demands from the outraged. Your power is already very limited by the nature of your “demands.” You are focused on things you want others to do for you. You spend very little time thinking about what you could and should do independently to address the problems you believe are holding you down. Indeed your whole agenda is an admission of your belief that you have no power. Improvements will come only if others act as you want them to, rather than by how you act day in and out as time unfolds. A movement based on the perception of their own vulnerability to weak and sometimes imaginary forces arrayed against you has a long way to go to enjoy real power. Frankly if the “Students of Color” went away, the campus would still function. Talk about arrogance and overstated self-importance. This is the truth. And it must sting like a sonofabitch. The campus wouldn’t only function, it would flourish without these distractions from cry babies. I wonder what will happen to them when they get jobs? This kind of behavior will lead to a pink slip and a hearty – don’t let the door hit ya where god split ya. So how is the capital campaign going, I wonder? Must be harder to get those multi-million dollars gifts when students and faculty seem to agree that Wesleyan is plagued by racists and rapists. Maybe some day the trustees and senior administration will tell us if they agree with this assessment. For now these two groups seem to believe that either silence or papspeak is a better alternative. Have you all taken leave of your senses? Now you want a micro-aggression tip line??!! The nation is laughing at you. They are laughing at your gutless president, Michael Roth, and they are laughing at your childish demands. Grow up and prepare yourselves for the real world, Folks. There are no safe spaces in the real world. Maybe they go destroy some more copies of the wesleyan argus. I hear it’s a favorite among wesleyan students before they graduate to book burning. A campus full of neurotics. Microagression, right there. Only privileged people benefit from criticism. Others are harmed, and made fearful. Has any member of Is This Why? enunciated even one example of “institutionalize racism” at Wesleyan? If not, what is the justification for spending even more money to relentlessly increase the size of the school’s administrative bureaucracy? Are the students even aware that they are paying for this through ever increasing tuition? Not the protesters of course, but the students forced to take out loans to pay for schooling. Why has Wesleyan forgotten them? not sufficiently understood and used across the campus,” he wrote. You see, the trouble here is that it seems to me that campus activists are very much interested in discoursing at length on “ion’s” and “ism’s,” grand theories of human oppression — that is, abstract concepts. But when you get down to the more mundane business of making plain English allegations of specific instances of discriminatory conduct, or even identifying specific “microaggressions,” they don’t really have quite so much to say. Maybe the administration doesn’t receive so many reports because, dare I say, there isn’t much to report? Why is it taken for granted that those complaining of discriminatory treatment are factually in the right?